I made this cake a couple weeks ago as a going-away cake for some friends. They are French, yet happen to hate French food - or at least he does. No cheese. No fruit or vegetables of any kind. How can that be? I can only imagine all the delicious, rich food I would gorge myself with if I ever lived in France. While he may not be into classic French cuisine, he does love his dessert. So I guess that is pretty French of him, no? This cake does no particularly remind me of a fine Parisian gateau, but it is undoubtedly sinful. This cake is all things rich, sweet, and decadent. And with the summer heat, if you are brave enough to turn on your oven, then you definitely deserve a slice. Moist banana nutella cake is layered with rich chocolate ganache and creamy buttercream. 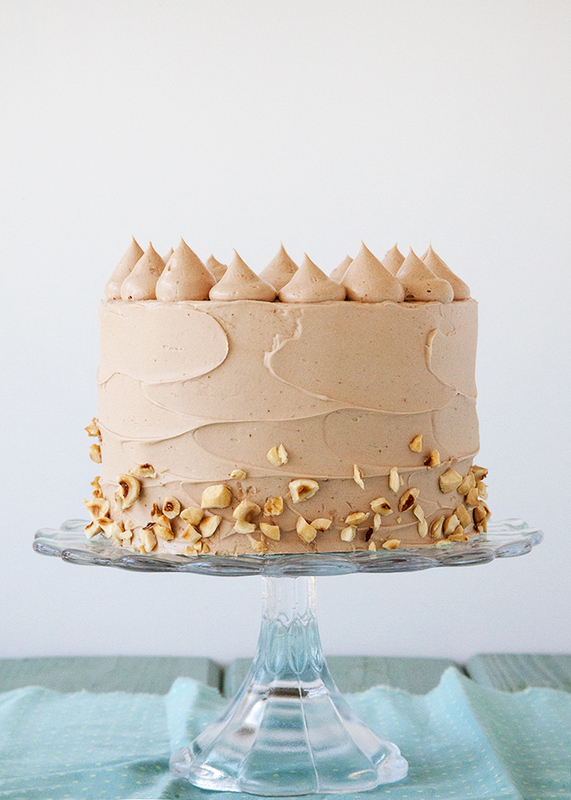 The same chocolate-hazelnut buttercream is used to ice the cake. Throw on some toasted hazelnuts for extra crunch and texture, and there you have it! Don't forget to serve with the salted caramel sauce - that's my favorite part. Find the entire recipe over on The Cake Blog.